Reformed online slot developer RTG did not always release epic 3D slots like its recently released popular smash hit slot Orc vs Elf. There was a time when it kept things slightly simpler and Naughty or Nice? is a prime example of that simplicity in action. This slot is a 5 reel, 50 pay-line festive treat that can be enjoyed at any time of the year because it offers more than a dose of Santa and some cheesy jingle bells. This slot is much deeper than your average festive offering and is more of a leftfield approach to festive slots gaming. The symbols across the reels include Santa himself, Mrs Claus, a present, reindeer, mistletoe and your usual array of regular symbols that run from 9 through to Ace. Naughty Wild or Nice Wild? The slot comes with two Wilds that consist of the naughty girl (ooh er!) and the nice girl (ooh er too!). It is these two Wilds that substitute for other symbols to complete winning combinations. 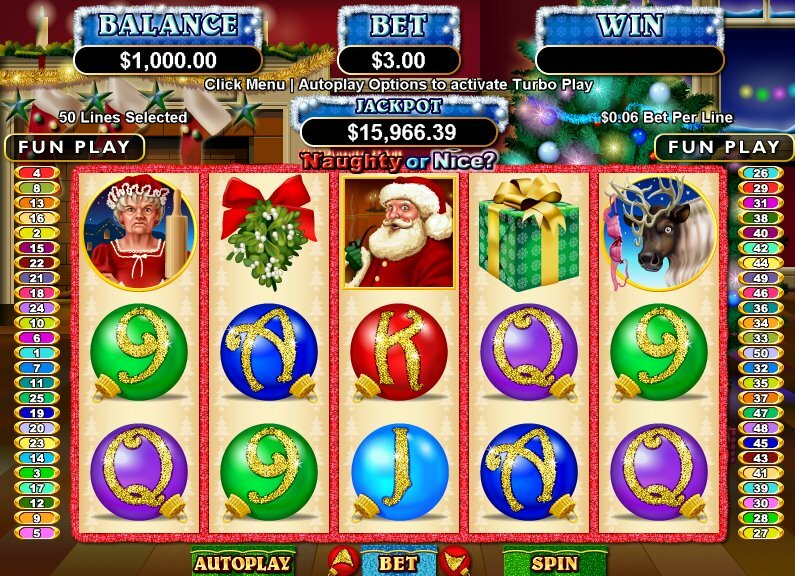 You must hit three or more of a combination of the naughty or nice wreath Scatter symbols across the reels to trigger the free spins bonus round. You will then be asked which girl you want to pick before being awarded 10 free spins. On every spin, you then have a chance to either win an additional free spin, earn a multiplier value or hold a symbol in its place for one spin if you hit the symbol of the girl you decided to choose heading into this bonus feature. There is a top jackpot prize of 10,000 coins to be won on this slot and that is triggered when you hit five of the naughty girl or nice girl symbols across the reels on this slot game. I have to admit, I’ve never been the biggest fan of RTG slots and they feel like they would not look out of place on a Commodore 64. However, the cheeky theme of this slot mixed in with a combination of two Wilds and a cool free spins bonus round sees it earn a place in my heart. 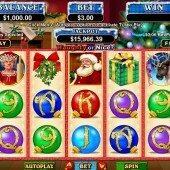 If you are looking for a more traditional Christmas slot then you might want to try Microgaming’s Deck the Halls slot!